What is the Mother Goose Time Preschool Curriculum? Recently, I received an email asking me for more information about Mother Goose Time. Mother Goose Time is a play-based, thematic preschool program. The activities from this program are regularly featured at The Playful Scholar. If you have questions about Mother Goose Time and the basics of how it works, this post is for you! Mother Goose Time sends a box containing all unique materials needed for any given theme each month. Inside the box are instructor guides that take you week by week and day by day through the materials. 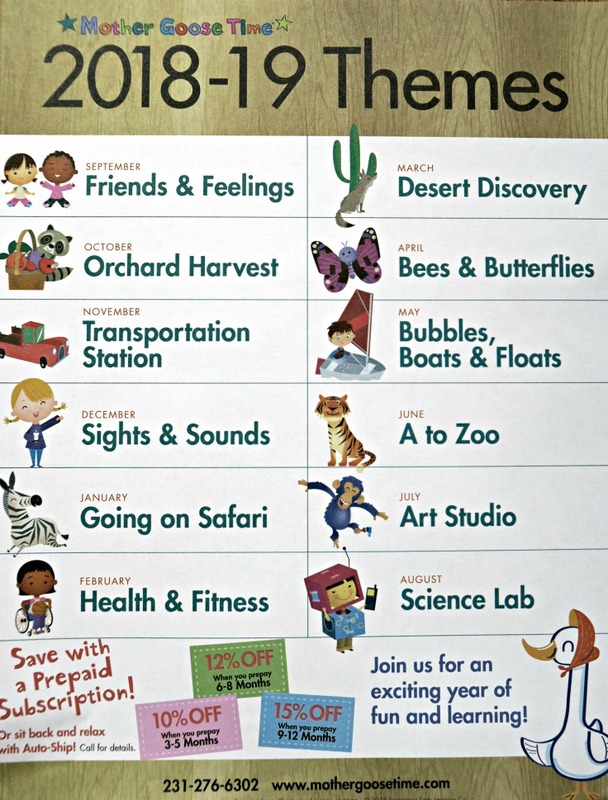 Recent themes include”Friends and Feelings” and “Orchard Harvest.” Check out all the upcoming 2018-2019 themes! Although the themes do reoccur in three year rotations, the materials are always updated to reflect current educational philosophy and customer feedback. The program has improved every one of the five years that we have used this program! During the summer months, there is opportunity for review with themes that include activities incorporating the entire alphabet, colors and shapes, and numbers up to twenty. Daily experiences integrate research-based skills through playful hands-on experiences. Community Challenges encourage kids to work together to solve a project, create something, or play a game. These challenges promote empathy and increase social awareness. It’s team building exercises in the early years! Through free play and table top games, literacy is introduced as fun and exciting. Kids learn how to identify letters by name and sound. Introductory reading concepts are offered. Mother Goose Time does a fabulous job of introducing basic mathematical concepts. My kids often have no idea that they are doing anything other than playing a game. Counting, sorting, shapes, pattern recognition, and basic addition and subtraction are all included. My kids love Mother Goose Time’s art projects. They come in two primary forms: “Invitation to Create” and “Make and Play”. “Invitation to Create” is a process based art activity that allows to kids to explore new mediums and make their own masterpieces with adults offering only prompts and inspiration. With “Make and Play” projects kids are provided an example and given the chance to make their own creation and use it in free play. My kids love it! Mother Goose Time provides suggestions for activities that are STEAM based. STEAM stands for Science, Technology, Engineering, Art, and Math. These activities are meant to give our kids practice thinking outside the box and following their own ideas, learning through trial and error. Each week STEAM activities are offered that focus on blocks, science and nature, sensory experience, dramatic play, and outside discovery. A unique story book is included with every Mother Goose Time thematic box. Additional suggestions are given for books to go along with each theme. Discussion questions meant to engage young learners in conversation and encourage independent thinking are also included in the teacher guides. Mother Goose Time provides ideas for circle time. This includes beginning the day with a suggested greeting song, weather pieces, calendar, and discussion questions. The discussion questions are tied to the day’s topic. The calendar also helps practice pattern recognition. Mother Goose Time includes discussion topics in their teacher guide. I rarely have any trouble getting the kids motivated to start talking once they see the topic poster that’s included with each day’s packet. All materials are packed by the day, so there is very little sorting or organizing that is needed. Simply read through the teacher’s guide the night before and gather any additional materials (scissors, glue, paint) that may be needed. Occasionally, you may need to cut some materials in advance, such as cards for a matching game. Additional reflection questions are included for after the day’s activities are done. My kids often enjoy talking about these over dinner, so they can share what they’ve done that day with Dad. For the family or preschool that has toddlers, there is a wonderful toddler supplement called Little Goose! For older students there are materials called More Math and More Literacy which are appropriate for kindergarten students. Both supplements are used in our homeschool and help make it possible to keep everyone engaged in the day’s activities.